If you’re interested in photographing the human connection, you’ll find you’re often shooting under less than ideal lighting conditions. Think of a concert venue, a child’s performance, or that indoors scene you want to capture spontaneously. You don’t have time to reposition the participants, turn on the spotlights and frame their faces just so. Three things go into the making of low light photography. Those are the amount of light passing through your lens, how long you can keep that light on your sensor, and how sensitive the sensor will be to the light. Aperture in the lens controls the first. Lenses are the topic for another article. Shutter speed and ISO are the two other aspects. For those, you’ll look to your camera’s settings for the answers. Consider how an image is captured by your camera body. You point your camera at your subject. After making some adjustments to frame your photo and cast that subject in the style you want, you press the shutter release. The length of time your camera shutter stays open depends on your settings. Those include the ISO or ‘speed’ of capture. Light travels through the lens and hits the sensor. That sensor translates the light it ‘sees’ into the digital version of the subject. The amount of detail in that photo is determined by the number of megapixels (points where light can be captured on your sensor). In essence, for great low light photography, size does matter, but size alone is not the determining factor. The interplay between sensor size, megapixels (MP), lenses, and other features can ruin a low light shot even with a big, MP-dense camera. Here’s why. Why isn’t it simple, like in low light, leave the shutter open longer? Shutter speed for low light work is best described as slow. The longer the shutter remains open, the more light that can hit the sensor, resulting in a fuller and more detailed image. However, unless you’re shooting with the camera mounted on a tripod with a shutter release cord, you run the risk of shaking the camera and blurring the image. Professionals recommend that to avoid blur, you equate your shutter speed to the focal length of your lens or zoom setting, adjusted for a full frame camera. On a full frame, 50mm means 1/50 of a second. For a crop sensor (APS-C) camera, this adjusts to 1.5 times the focal length or 1/75, which means you’ll need a higher ISO to compensate (more on that in a minute). The sensor sees the light, and the bigger it is, the more it can see. A full frame camera is equivalent to 35mm film, so it’s considered the base factor of 1. Micro Four Thirds (MFT) sensors are roughly twice as large, so mirrorless cameras with MFT sensors make great low light options. Don’t rule out APS-C sensors, though, because what they lack in size they can make up for in other aspects, such as equivalent lens focal lengths, weight of the body, and features. Even compact cameras with still smaller sensors can take good photos in low light, with the right adjustments to settings. This is why size of the sensor doesn’t matter all by itself but works in a complementary fashion to other aspects of shooting. The more megapixels, the better, right? Megapixels represent the number of places on the sensor recording a digit of light. It would stand to reason that a 51MP (that’s 51,000 points) would be twice as good as a 24MP. Some photogs reason that the higher MP sensors create sharper details in the image, but as you read on, you’ll see that this alone does not guarantee there will be no graininess in the results. Professionals seem to agree that anything above 24MP is probably not required in most shooting situations, unless you are in fact a pro and you’re turning your images into large format art. That size is a good trade-off between detailing and file size, while giving you plenty of room for post-production adjustments. Some people have reported that sensors with much higher MPs are also prone to more frequent and rapid pixel failures too. What does ISO range mean? Native ISO is the range in which the manufacturer will certify good image quality. Much as film ISO labels did before, these ranges tell us as photogs how sensitive the sensor is to light. The greater the number, the higher the sensitivity. Some reviewers recommend shooting at the lowest possible ISO setting based on your subject, intended framing, and lights, because at higher settings, distortion will become apparent in your resulting image. Noise or graininess is caused by a combination of high ISO and fast shutter. But blurring comes from a low ISO and the need for a much slower shutter speed. Is expandable ISO better than native? Expandable ISO lets you capture more light, which can benefit you in low light situations. Each doubling of the ISO number also doubles the amount of light. The camera looks at the light it does capture and makes digital adjustments to fill in light when your camera can’t. Experts recommend staying within the 1600 to 3200 range to avoid graininess and noise, and if your camera is a low light workhorse, perhaps going as high as 6400 to 12800. 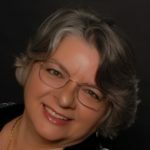 To find the sweet spot on any camera, stage a low light scene and shoot at various settings beginning at the low end of the ISO range and working up. Image quality will tell you how much risk you want to take when you adjust that ISO to compensate for darker lighting conditions. If one method of capturing more details in low light is to keep your shutter open longer, you’ll want a way to control shake and its resulting blurring. Image stabilization (IS) in the camera body compensates for the minor shaking that can occur as you shoot. It works with your body’s autofocusing system to help you get a clean image by making mechanical adjustments to that image capture process. What kind of autofocusing system works best in low light? You want an autofocus (AF) system that can assess the subject and lock on quickly. It does this through AF points as you aim and frame your shot, and the number of points varies based on the camera’s system. You might think the more points, the better, but you also need to think about the speed of the adjustments too. AF systems have three common types of autofocusing detection. Contrast detection makes the up close details crisper, while phase detection tracks moving objects of other continuous changes to AF better. Face detection finds the faces in the frame and focusing on those more quickly. The general rule is that having all three detections plus lots of focus points is best, as long as the mechanics move with agility. Since AF integrates your lens to your body as well, that complicates matters. The mechanical processes of different AF systems vary, and there is no one best type for low light work other than fast and accurate. What about shooting low light video? The difference in quality in low light video is based on the resolution. The greater the resolution, the more detail you can capture. The ultra-high definition standard for video resolution is 4K. This doesn’t mean a lower resolution, like 1920 x 1080 or the rough equivalent of 2K, is bad. If you intend to use your video on small screen formats, like cellphone or tablet displays or even computer screens, 2K will probably be fine in low light. The bigger the screen, the more you’ll want that higher resolution. Low light emphasizes the graininess of a lower resolution video. Think about the nighttime security footage often aired on the evening news and you’ll see evidence of that effect. However, that video was intended to only be viewed on a small screen, so blasting it on to your wall-sized television is going to distort it no matter what. Is an LCD better than a viewfinder? Professionals and reviewers don’t agree on this, and that’s because there are no standards on size or equivalents among what’s available. If you’re used to looking through a viewfinder and can frame a shot in low light with one eye pressed to the window, you’ll probably say a viewfinder is best. Even that, though, can be questioned, since not all viewfinders cover 100% of the sensor’s possible range. LCDs on the back of the camera body can be good tools in low light because they let you see what the camera does. Electronic viewfinders in mirrorless cameras work in much the same way. They let you see if you’re gathering enough light in real time from your surroundings to make an image work. That being said, the opposite can also occur. You can’t see enough on the LCD, but if you had a viewfinder and could focus and frame more accurately as a result, the camera can do the rest. This is particularly important if you rely on the electronics to make ISO adjustments, you’re shooting with a slower shutter speed, or you shoot on automatic and let the camera worry about the details. Can I use any lens for good low light photography? The aperture is what determines how much light is heading down the lens for the sensor, which is where the magic begins. Therefore, any lens has the potential for low light work. This being said, if you’re shooting predominantly in low light settings, you’re probably relying on a prime lens with a wide aperture (a low f/ number). As this relates to low light photos, though, it’s more important to think about how many lenses choices you have to work with your camera. Canon and Nikon both have hundreds of possibilities, both brand and third party. Mirrorless cameras have a growing number too, and for that reason, this is less an issue in body selection than other factors. Keep in mind that mirrorless lenses are different from those used on DSLR, though there is some cross-over in usage with the range of adaptors offered today. Lenses rated for mirrorless only cannot be used on DSLR bodies. Some DSLR lenses, though, can be adapted for mirrorless bodies. Which is better for low light, mirrorless or DSLR? Back to mechanics, where the digital single-lens reflex has more moving parts and therefore, more noise and weight. Mirrorless, on the other hand, is generally quieter and lighter. Some reviewers stand by mirrorless being the best simply because of those characteristics. But really, there’s no one best style, other than the one you shoot based on your ability and expertise. If you need something that tucks in your pocket, you will be better off with mirrorless. If you want a camera with more pro features, you’ll probably swing toward DSLR. There’s no single criterion that can be the deciding factor in your low light camera body selection. Features work together and based on how you like to shoot and when the magic happens, you might find compensating aspects in our choices. To give you a feel for what you should be looking at in the big picture, here are the criteria we’re focusing on for this comparison. We limited this comparison to interchangeable lenses cameras. The two big choices there are mirrorless and DSLR. DSLR are generally heavier in weight, though not necessarily on your credit card. Recall that earlier comment we made about mirrorless lenses, though. If you shoot other DSLR bodies, you’ll probably want to stay in that same camera type family (and maybe even brand and lens mount style) so you aren’t investing in two sets of lenses. Likewise, if you cannot afford to buy a lot of DSLR bodies, you’ll want to refer to our other articles on cameras on Photophique to determine if the other kinds of shooting you do are appropriate with your pick. Professionals like full frame or MFT sensors based on size, though you’ll see many prize-wining low light shots taken with APS-C sensors these days too. It’s more a matter of other properties related to sensor size beyond the scope of this article, like equivalent focal length of lenses, price, and brand. We’re noting megapixels in this criterion to compare the density of those points as well. Since we’re discussing low light work, you’ll want to concentrate on the native ISO range for these cameras. Expanded ranges are noted as well for your other shooting needs. Keep in mind the sweet spot range the pros recommend for low light photography. Having a built-in flash can be both a blessing and a curse. Adjusting the lighting in your setting with the camera body alone makes your shooting more immediate. However, those flashes often have a limited range, which means when we use them, we sometimes light up the area between us and the subject, but not the subject. Think about if you would use a flash in your common low light shooting. Candid shots at a darkened wedding reception hall or catching interesting people on a nighttime street would be interrupted by a flash of any kind. Sometimes it is best to work through your shutter speed and ISO to make those lighting adjustments instead. We’ve noted the number of AF focus points and cross type if available. Cross type allows the camera to lock on the subject more quickly. In our description we expand on the detections available and any other feedback on capabilities. For low light in particular, IS helps avoid camera shake and image blurring. IS is also available in compatible lenses. We note the video resolution capabilities of each camera in our stats. In the following text, we note if the camera has any other video-related features, such as frame to image capture. The lighter the camera body, the easier it will be to frame the shot in low light conditions. You can add more lens without worrying too. The lightest will typically be the mirrorless with fewer heavy mechanicals. Let’s take a look at our ten best camera bodies recommended by reviewers for low light shooting situations. Order does not imply a ranking, though most agree that our first listing is best in show overall. While this camera is relatively new on the market, it’s already rated by many reviewers as best overall. Look at what you get, like high video resolution plus high speed video for slow-motion presentation, a sweet native ISO range, and IS. All of this comes in a full frame sensor package with what pros call the perfect MP for low light work. 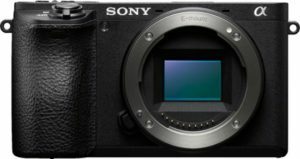 As the latest entry into the Sony array of professional grade mirrorless bodies, it is lighter than many other brands on our list without sacrificing features. It has both an articulating LCD touchscreen to make setting changes with ease and a 100% coverage electronic viewfinder, so you can select which framing style works best for you. It is rated as great in low light ISO conditions and boasts a max fast shutter speed of 1/8000 of a second. The Sony E lens mount is compatible with a long list of both native and third party E-mount lenses. The premium sensor-based IS gives you plenty of candid shot flexibility. Its AF locks in fast in near darkness, with more focus points than almost any other out there and all three detection types plus eye tracking available. It’s difficult to find anything to criticize on this camera. Some might consider the weight a little heavy, particularly when a lens is added. The camera has no built in flash, but for your average low light situations, that probably isn’t a real issue. The battery life is twice as long as the average in this class. In addition to low light photography, this Sony is ranked as excellent for just about anything you want to shoot. 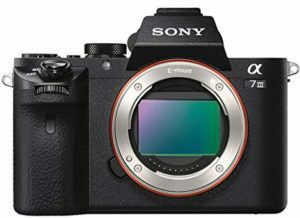 With the ever-growing number of lenses available, your selection of this latest addition to the pedigreed Sony a7 line is hard to beat. This semi-pro mirrorless camera is what many call the value end of the Sony line, all done without skimping on important low light features. It shares many of those with its pro peer above, like LCD touchscreen plus electronic viewfinder, and array of native and third party lenses. Its hundreds of focus points and full set of detection phases makes AF a breeze. In addition to the family resemblance, it has a few characteristics the a7 does not, such as a built-in flash you can adjust with the touch of a finger to bounce your light off the ceiling, a nice touch for close low light situations. It also sports an electronic shutter that maxes at 1/32000 of a second, though there are some concerns about rolling effects in your resulting image under some conditions. While not directly related to low light work, the a6500 has panorama shooting capability to stitch together a series of photos. You can control the camera with your smartphone, and it also offers time lapse with a downloadable app. The battery life on this camera is considered average, and it will fall below that if you rely on the built in flash quite a bit. That being said, there are few if any other major complaints about the a6500. If you want flexibility for other kinds of shooting situations, this body is rated as excellent for portrait work and street photos. It’s also a contender for carrying in your pocket to shoot the daily world around you. It is easy to use and easy to handle, making it a wonderful tool to capture the candid world around you. 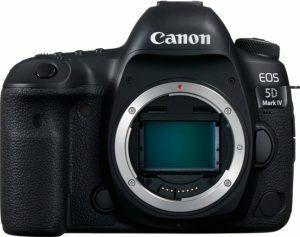 Rated by many as the best Canon overall for low light work, this semi-pro DSLR offers manufacturing quality, broad lens selections, and myriad robust features the brand is known for. Its denser MPs will gather detailed images on your 100% coverage sensor, with a wide native ISO range to help you control your shot under a variety of conditions. The joint features of fixed touchscreen and optical viewfinder further aid your framing. At 900 shots, the battery life is superb. In addition to good ISO control, particularly in low light, the fast shutter speed of 1/8000 of a second gives you flexibility for artistic images as well as other kinds of photography. All three detections are available in its AF system with 61 focus points. Video resolution of 4K means you’ll have big screen worthy files to share. The Photo Mode stills image capture feature fills the need for those times when you want both but can’t shoot them at the same time. The body even has an electronic level to keep your horizontal lines on a straight path. Weight of the body alone is definitely a consideration when buying this Canon. Couple that with the lack of IS, and you’ll need to carry a tripod along too. While the number of focus points is not as large as the previous entries on this list, 41 of those focus points are cross type which lock on the subject faster and allow the AF to do its work. This DSLR will do great low light work under conditions where you can put a little more planning into your set up. It’s best for close in settings, and for those situations where the distraction of a tripod won’t be an issue. If it’s sports or other fast action that you want to photograph, this could be a great choice for your gear sling bag. 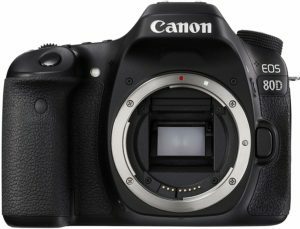 While the previous Canon entry on our list came in with a higher price tag, this 80D is deemed to be the best Canon value for spur of the moment low light shooting. This semi-pro body gives you the same range of lens choices as more expensive models. It shares the same fast 1/8000 of a second shutter speed to give you more flexibility under other shooting conditions. The 45 focus points are all cross type, which means the AF system will lock and respond faster across all three detection types. An articulating LCD touchscreen makes setting changes quicker, and your optical viewfinder means you have a choice about how you frame your shot. There are a few trade-offs for the lower price point on this camera, such as less video resolution, a smaller sensor, and a narrow ISO range. While the low light ISO performance is ranked as good, the weight and lack of IS means you will need to be more careful in framing those kinds of images. Its size might be considered large by some for handling in candid shot settings. This being said, the 80D is rated as a good all-around choice for those common settings where you want to capture the moment without a lot of fanfare. It doesn’t quite disappear into the background, but it does the job you demand of it in most low light situations. If budget is a factor in your decision, think about this value-driven version in the Canon line. 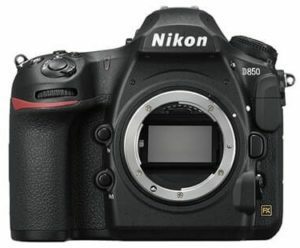 Deemed by reviewers as the best overall choice in the Nikon line for low light photography, this semi-pro DSLR is the latest offering in a long line of D800’s. The MPs on this full frame sensor are among the highest available across the market. An articulating LCD touchscreen and optical viewfinder provide choices on what to use to frame your shot. A wide native ISO range works well with the high number of focus points in the AF system, and the 99 cross type points will give you faster lock on and adjustments under all three detection types. The camera is rated as good for low light ISO situations. The faster shutter speed is 1/8000 of a second and higher resolution video are two other things users comment on as positives. This Nikon has more going for it, such as the battery life expectancy double that of the average in this class in terms of number of shots. It has the highest shutter life expectancy as well, 200,000 cycles. The buttons on the body illuminate, a great feature for those low light shooting conditions. The heavier weight of this DSLR and lack of IS means you’ll be toting the tripod to avoid camera shake. However, a high number of the long list of native lenses offer IS, so you might be able to compensate somewhat with an informed lens choice. Its lack of an anti-aliasing filter means you may experience moiré if you’re shooting repetitive patterns in your low light conditions. These issues aren’t so much shortcomings as things to be aware of if you select the D850. This camera will be most appropriate for those low light situations where you can spend a little time framing and making setting adjustments before you capture your shot. Since it works well under a variety of other styles of photography, it’s a good choice for an all-purpose camera to carry you to a new level of skill. If you’re looking for a value in the Nikon brand, this semi-pro DSLR gives you plenty of features at more of an entry level price point. The expandable ISO range goes to a whopping 1,640,000 (no, that’s not a typo), and it’s deemed good by reviewers for low light shooting without graininess up to 12800. Framing through the optical viewfinder or the articulating LCD touchscreen is easy. For low light work, its 51 focus points and 15 cross type points produce adequate lock on and focusing speed across all three detection types. The AF system allows you to make manual micro adjustments once the system has locked on. A 1/8000 of a second fast shutter speed gives you other styles of shooting options with this good walk around or travel camera. There have been some concerns about the expandable ISO on this body, and while this is not relevant for low light work if you stay in the pros’ recommended sweet spot range, it is a consideration if you plan to use this camera for broader types of photos. You can compensate for the lack of IS through your lens selections. Keep in mind that the lack of an anti-aliasing filter means some images of repetitive patterns may be distorted (moiré). If Nikon is your preferred brand and you want a camera good for low light as well as other styles of work, this could be the choice for you. It’s portable and flexible, while meeting most of your common photo setting needs. Not everyone needs a full frame camera, particularly when a crop sensor model like this comes along. If shooting video is your preferred style, this offers you features many others do not. Super high speed video of 180 frames per second means your slow motion results will be artistic and unique. The articulating LCD touchscreen and built in electronic hi-res viewfinder give you framing choices too. Pros like the 1/16000 of a second maximum electronic shutter speed. 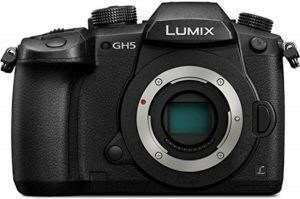 Micro Four Thirds lenses made by Panasonic and Olympus are highly regarded in quality, and third party vendors also offer a broad selection to choose from. With so many options plus IS resident in the body, this camera works well for many kinds of candid low light and other shooting styles. The AF system has two detection types, Contrast and Face, with an impressive 225 focus points. A Post Focus capability allows you to change the central focal point after the image is captured. The Focus Stacking feature maximizes depth of field in your resulting still images, and the videos can be used to create still images as well. A breadth of features means the camera works hard, translating into a lower battery life than other bodies on our list. While it’s not as easily totable for daily work around town based on its ergonomic size, it handles well under most conditions. Having IS means you can move more quickly to get that perfect shot when needed. Some can argue this isn’t the best camera for action shooting, since it lacks Phase Detection in its AF. However, the pros rating this camera don’t seem to be bothered by this shortcoming. The big Four Thirds sensor means you’re going to get photos unlike what you find with full frames or crop sensors, and that alone can set your images apart. 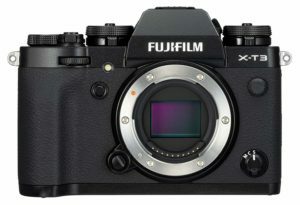 This semi-pro mirrorless offering from Fujifilm seems made to order for low light conditions. It comes from a long line of X-Ts that have been well-regarded by reviewers for years. Among the features most mention are the exceptional 1/32000 electronic shutter speed and the fast 20 frame per second continuous shooting. A great reason to consider this camera is the impressive 425 focus points in its AF system that power the three detection types with ease. Framing with either the LCD touchscreen or the built in electronic hi-res viewfinder is easy. While Fujifilm makes less than 50 native lenses, this camera can use Nikon F mount lenses with an adapter. This camera lacks IS, which can sometimes be offset by the choice of an IS lens. The battery life is ranked as low, so having an extra available will be a must. While the body shape isn’t large, it is heavier for its size than others in its category (but light enough and small enough to tuck in your pocket). The lack of an anti-aliasing filter means you run the risk of moiré in your images. The X-T3 is a good choice if you want a more discrete option for your low light work. Add in things like the extra image storage SD card slot and you have a camera with flexibility to follow you into all sorts of situations with confidence. It’s perfect for the switch to video too. 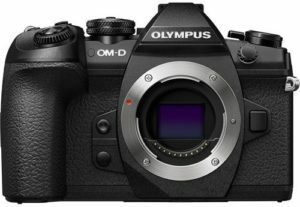 There’s something about the larger Four Thirds sensor that attracts the pro rating, and this Olympus is no different. While the 20MP might not impress some, it also boosts a 50.0MP sensor shift high resolution mode. The camera takes multiple shots of scene while moving using the IS system and stitches those images together into the higher res result (best done on a tripod). A maximum shutter speed of 1/32000 of a second means it’s great for other shooting situations too. The articulating LCD touchscreen on this camera is selfie-friendly, while you can also choose the built in electronic viewfinder for framing. Its AF with a moderate number of focus points works well across all three detection phases. Olympus offers almost a hundred native lenses for this camera, and it can also use those from Panasonic’s Micro Four Thirds line as well as third parties. Given the great rating for low light ISO, this choice might be easy. About the only complaint on this camera is the battery life, which is very low. Carry a charged spare. Handling it is easy with good ergonomic structure and an average weight for its class. It excels in both street and action settings, making it a good all-purpose choice for many. This camera made the list because it does the ultimate low light kind of work, astrophotography. An Astro Tracker mode uses your GPS location and sensor shift to track stars and create a time lapse photo without trails. If stars are your thing, this adds serious gravitas to your options. While this is not the only thing this semi-pro camera can do, it meets almost all of your needs if you need to switch between various styles of photography. 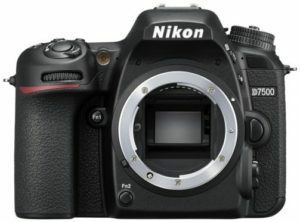 The latest generation of the highly esteemed K-1 line for almost any kind of work, many pros keep this DSLR in their camera bag for those times when they need flexibility and features. 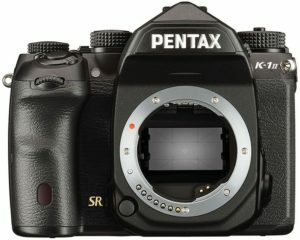 Almost 150 lenses are available for its Pentax KAF4 mount. Framing through the optical viewfinder is supplemented by the LCD screen. An anti-aliasing simulator offsets any moiré in repetitive pattern shots. All three detection types are included in its AF system. The LCD screen is not a touchscreen, meaning you will need to make your setting adjustments via the buttons and dials, or via the smartphone remote control app. The body is heavier than others in its class, which may mean you’ll want a tripod to avoid camera shake. The AF system sports the fewest focus points in our comparison, and the video res is not Ultra HD. Why should you buy this camera? If you shoot the night sky, the K-1 II has no match. Put this camera on a tripod and point it upward to see how great it can be. I own a Canon 80D and I have nothing but good thing to say about this camera. It performs really well in low light. My partner and I have a photography business and we’ve been using it as our backup camera to our 6D. Highly recommend to an amateur as well. Video and audio where both very clear.